Judging by the photo above, you would think the man was a German brewer, but William Howard was actually the 27th president of the United States. His term stretched from 1909 until 1913. 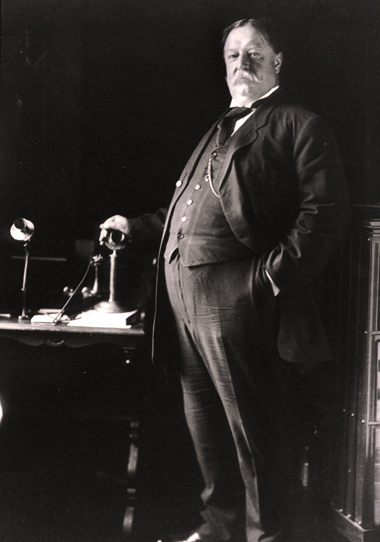 Taft was the one who appointed Henry Lane Wilson US ambassador to Mexico. On October 16, 1909, President Taft met Mexican President Porfirio Diaz at the Chamber of Commerce in El Paso, Texas. The two then moved on to meet again across the border at the Mexican customhouse at Ciudad Juarez. It was a big deal because it was the first meeting in history between the presidents of these two countries. William's father was Alphonso Taft. Williams' mother was Louisa Maria Torrey. In 1886, William married Helen Herron.